Q: How does a Montague bicycle fold? A: Using the patented Concentrus™ or F.I.T.™ system, the bicycle frame utilizes the seat tube as a pivot point frame, secured by quick release levers, which allows the rear frame to pivot around and fold neatly into the main front frame. The entire process takes less than 30 seconds. Q: What is the folded size of the bicycle? A: Approximately 36 in. X 30 in. X 12 in. (varies slightly depending on frame size). Q: Are any tools needed? A: No, all Montague bicycles are designed to be folded without the use of tools. Q: Is the frame strength or rigidity compromised by the folding feature? A: No. A Montague bicycle looks and rides like a similarly equipped non-folding bicycle. Because we use full-size wheels, standard componentry, and avoid using any weak or flimsy hinges to fold the frame, the performance of a Montague is indistinguishable from a high quality non-folding bicycle. Q: Could the bicycle fold while being ridden? A: Not a chance. A precision-engineered, spring loaded pin automatically locks the frame into place when it unfolds to the riding position. A: Our bicycles that fold weigh about one half of a pound more than similarly equipped bikes that do not fold. The weight difference is due to the concentric seat tube. One half of a pound is less than the weight of a full water bottle. Q: Who needs a Montague bicycle that folds? A: Everyone. 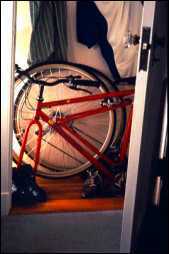 The most common use of our bikes is for convenient and safe storage in a closet, car trunk, private plane, boat, or RV. With our bicycles there is no need to install a paint scratching roof-rack on your car. A number of our owners also ride Montagues because they are so easy to travel with on trains and commercial airline flights. Finally, many owners find them extremely convenient for commuting because they store easily at work and in small urban apartments. Since the performance of our bikes is equal to and in many cases better than non-folding bicycles, there is no reason why everyone should not have one. Q: How does the Montague compare to other bicycles that fold? A: The other bicycles on the market that fold generally have small kid-sized wheels and require substantial disassembly to fold the bike. Many of these designs also cut the frame tubes which loose their torsional rigidity. The Montague design is the only one which successfully combines high-performance and strength with a single compact folding feature. Q: What about service and repair? A: All Montague bicycles use standard equipment and components that any of the 7,000+ bike shops in the USA either have in stock or can get easily. Q: Can a Montague bicycle be checked on commercial flights? How? 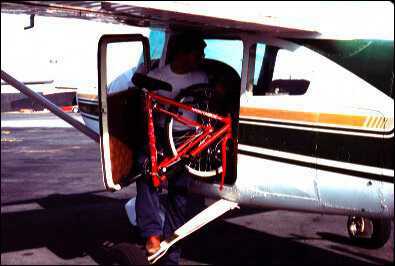 A: Yes, all Montague bicycles can be taken on commercial flights. We sell the Airliner I case which allows all of our single bicycles to be checked as airline luggage. In its suitcase, the bikes are also very easy to get into taxis, rental cars, and out of hotel rooms. Q: How well do Montague bicycles hold up in a saltwater environment? A: When on a boat, we suggest that the bike be stowed below deck in its water resistant carrying case. The clear coated special four layer paint helps protect the Chromoly and aluminum frames from rusting. The inner seat tube is nickel-plated, and all models come with stainless steel spokes to resist corrosion. Montague's bikes are very popular among sailors and power boat owners. Q: Do racks and fenders work on the Montague? A: Absolutely. Single-stay racks work on Montague bicycles with the Rear Rack Attachment Bracket. Its use allows the bike to fold completely. All rear fenders work; front fenders must be removable clip-on type (we recommend Mt. Zefal fenders). Q: Are folding pedals available? Why aren't they included with the bike? A: We do not use folding pedals as original equipment because they are not readily available at any dealer for replacement or service. We use quality pedals and give consumers the option of adding Montague folding pedals as an accessory (folding pedals available from Montague). Q: Is a kickstand available? A: Yes, a specially-designed bolt on kickstand which does not interfere with the folding feature is available from Montague.